Builders constructed the World Trade Center using about 400 tons of asbestos in the structure’s insulation, drywall, fireproofing materials and steel because of the mineral’s heat resistance and affordability. 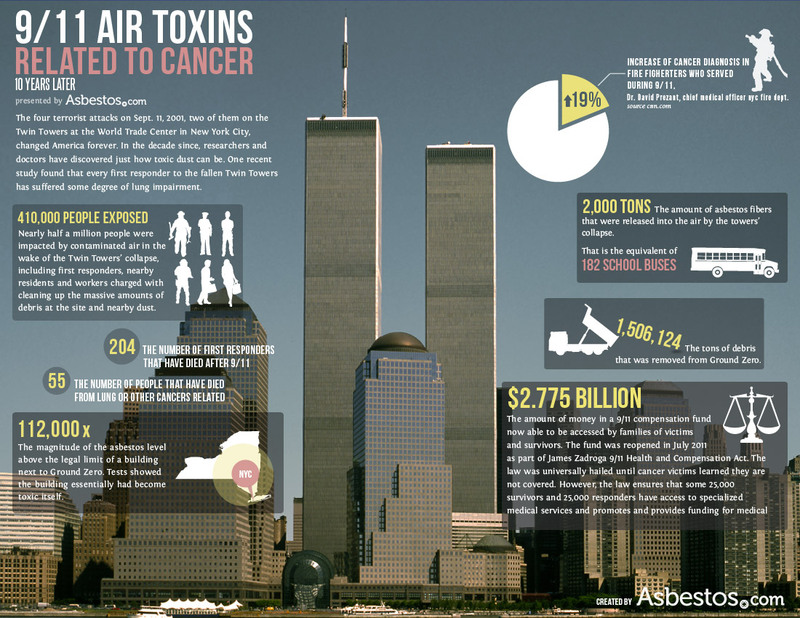 The 9/11 terrorist attacks released the deadly toxin in a dust cloud across Manhattan. When the Twin Towers collapsed to the ground on September 11, 2001, a massive cloud of smoke, dust and debris released hazardous asbestos fibers and other toxic substances into the air. Asbestos fireproofing materials from 20 stories of the towers fell down on New York City. The World Trade Center Health Registry estimates about 410,000 people were exposed to a host of toxins including asbestos during the rescue, recovery and clean-up efforts that followed 9/11. People most affected by asbestos at Ground Zero were people assigned to rescue survivors. These workers were among the first on the scene and the last to leave the wreckage. Search and rescue workers and others responsible for cleaning up the debris in the months after the towers collapsed were also exposed to asbestos. This toxic substance raised health concerns even as construction of the towers began in 1966. When construction of the North Tower was well underway in 1971, the World Trade Center builders halted the use of asbestos because a ban on the material was expected in the near future. But by this time many asbestos-containing products had already been incorporated into both towers. These asbestos products did not pose a health concern until 9/11, when asbestos fireproofing materials from 20 stories of the towers came showering down on New York City. According to reports from the U.S. Environmental Protection Agency (EPA), the implosion of the towers “pulverized asbestos to ultra-fine particles” and scattered the debris over Lower Manhattan. Exposure to asbestos can cause life-threatening illnesses such as mesothelioma and asbestosis. These diseases normally take between 20 and 50 years to display symptoms. But in 2006 — five years after inhaling the toxic debris from Ground Zero — an emergency responder from 9/11 died of mesothelioma. Another worker, 41-year-old Deborah Reeve, developed a serious cough just two years after the attacks and died of mesothelioma in 2004. Experts expect a larger number of 9/11 responders to be diagnosed with these illnesses in the upcoming years. That’s because many of these first responders and workers who assisted in the clean-up and recovery were ill-prepared to face the airborne contaminants, and few were given adequate respiratory protection in the months after 9/11. Workers in a number of occupations and others who were in New York City on 9/11 were affected by the collapse of the World Trade Center buildings. As of September 2009, the organization 9-11 Health Now reported that 817 World Trade Center workers had died from various causes. About 40,000 were enrolled in medical monitoring and 20,000 were “sick and under treatment.” Many had upper respiratory issues, while some reported multiple medical concerns. A number of these people are receiving help from designated World Trade Center programs at facilities such as Mount Sinai Medical Center. Exposed to Asbestos During 9/11? Get connected with a mesothelioma specialist who can help you or a loved one diagnose an asbestos-related illness. Following the 10th anniversary of the 9/11 attacks, the U.S. government passed the James Zadroga 9/11 Health and Compensation Act, a law created to provide medical care and monitoring to people with health conditions related to the collapse of the World Trade Center. The Zadroga Act builds upon a 2001 compensation fund Congress set aside for people injured or killed by the terrorist attacks. Its approval, which set aside $8.1 billion in funds, extended the benefits to first responders, cleanup workers, New York City residents and others who were exposed to toxic dust released from the Twin Towers. Although the original terms of the Zadroga Act only offered compensation from 2011 to 2016, Congress voted to reauthorize the program in 2015, extending coverage for another 75 years. The renewal secured lifetime health care for qualified claimants, who may develop asbestos-related illnesses such as mesothelioma decades after their exposure to 9/11 dust. Tens of thousands of people who breathed the toxic dust and smoke released after the 9/11 attacks later developed serious respiratory illnesses and several types of cancer. Many have filed lawsuits to seek monetary compensation, alleging the dust caused their health problems. In 2010, more than 10,000 rescue and recovery workers claiming to be injured by the dust opted into a $713 million court settlement from WTC Captive Insurance Co. Inc. Previous settlements with other defendants, including the Port Authority of New York and New Jersey, bring the total settlement awards to about $810 million. At first, there was no scientific evidence to confirm an association between dust from 9/11 and the development of cancer. However, a 2011 study involving firefighters exposed to World Trade Center dust proved this group is 19 percent more likely to develop cancer than the general population. Prior to 2012, the Zadroga Act did not offer compensation to claimants who developed cancer because of the lack of evidence linking cancer to 9/11 dust. People with cancer now can file a claim, but payments will be reduced if the claimant was awarded money from a 9/11 lawsuit. Some of the cancers diagnosed in those exposed at Ground Zero include melanoma, thyroid cancer, prostate cancer and blood cell cancers such as leukemia, non-Hodgkin lymphoma and multiple myeloma. Because asbestos-related cancers, such as mesothelioma and lung cancer, are slow to develop, lawsuits linking these conditions to 9/11 exposures may arise in years to come. Dr. Craig Stevens, a mesothelioma specialist at the Moffitt Cancer Center in Tampa, predicts a spike in mesothelioma and lung cancer cases starting in 2021 — two decades after 9/11. He expects the number of cases to peak by 2041. Daniel King joined Asbestos.com in 2017. He comes from a military family and attended high school on an Air Force base in Japan, so he feels a close connection to veterans, military families and the many hardships they face. As an investigative writer with interests in mesothelioma research and environmental issues, he seeks to educate others about the dangers of asbestos exposure to protect them from the deadly carcinogen. Daniel holds several certificates in health writing from the Centers for Disease Control and Prevention, and he is a member of the National Association of Science Writers.